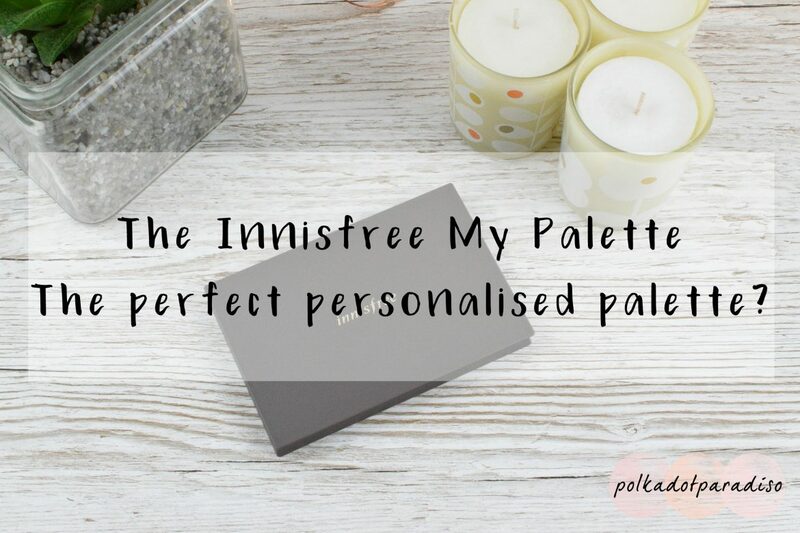 Innisfree My Palette – the perfect personalised palette? I love palettes. They’re probably my biggest beauty weakness. Particularly full face palettes. I even did a review post on my favourites a little while back. Even though I wasn’t in the market for a new one, I couldn’t help but notice the Innisfree MyPalette system a while back. With three different sizes of case and an array of eyeshadows, highlight, blush and even concealer I couldn’t help but be drawn in by a palette I could completely personalise to my own specification. I went with the medium sized palette that had eight pan spaces. The small case has four pan spaces, and the large has twelve. With the pan you receive a plastic cover that goes inside and two double ended applicators. Inside the top of the case there is also a mirror. In terms of a handy travel palette, this is ideal. Because I like my palettes to do more than just eyes, I purchased four eyeshadows, a blush and a highlight. As both the blush and the highlight take up two pan spaces, this filled my palette. Each pan comes in a (quite wasteful) plastic case. You can then easily pop out the magnetic pan and place it into the case. The black you can see on the bottom of the case is a magnet. While I was tempted to go for the concealers, I wasn’t keen on the idea of powder getting into a cream concealer meaning I’d have to clean it every time I wanted to use it. There are three categories of eyeshadow you can purchase. Glitter, shimmer and matte. I purchased two mattes, a shimmer and a glitter. Unfortunately, as you may be able to see in the picture above, my shimmer arrived faulty. It’s two different shades, when it’s just supposed to be the top shade. The powders are very soft and nice to use. They swatch nicely on the hand. My favourites are the two warmer colours. The glitter I wasn’t initially sure of, but since I swatched it I fell in love a little bit. The blush is available in a cream or a powder. I went with the powder. The same applies to the highlight – available in both cream and powder. Again, these are very soft and easy to use. The blush takes a little building and the highlight has a lovely sheen to it. Unfortunately, I wasn’t too impressed with wearability. Those swatches on my hands you saw above? They just wiped straight off my hand with no trouble at all. While the blush and highlight lasts well throughout the day, the eyeshadow does not. Even using a primer I’m lucky if I can get past lunch before the colour just folds into nothing. This is a massive shame. This could have been the perfect palette! The palette is an ideal size and having the freedom to choose exactly what colour I wanted meant I picked a completely personalised palette. But if I can’t get the eye colour to last all day then I fear this will be cast aside pretty quickly. As I like the highlight and blush I may purchase a small palette the next time I place a skincare order from Jolse so when I’m travelling I can take that and a separate eyeshadow palette.